I went to their blog today and found this, it was dated January 21st. There are still items for sale and so if you want to stop by their shop, please do. I think it is amazing what all of you bloggers are doing out there. Is there hope in this world? Yes!! Does love still abound? Yes, in the hearts of each of you!!! As of this morning we have raised just over $20,000 for Doctors Without Borders, 1,155 sales, and currently have over 155 items for sale in the shop. We have approximately 300 more listings to add to the shop. Please do not be confused and think the shop is closed. We are OPEN for business. We just need to take a two week break to get a more formal system in place for accepting donations. Please spread the word that you can support Doctors Without Borders by shopping in the Craft Hope for Haiti Etsy shop. Just look to the right on that side bar, you can find the shop there! ARE YOU SICK OF THE SNOW BALLS YET? Last night I put the border on....I love the brown in there, I know you can't see but there is brown in this quilt and well...I just love it. I wanted a wider border but that is all the material I had of the blue. So....I am thinking of putting another small brown border with the next lighter color from the quilt next to that? What do you think? What do you think of this potholder now? More vintage fabric (I have alot of brown vintage fabric from the 70's). I just love it!! I decided to put one more row on this quilt. Right now it is on a queen size bed. And.....no...I could not just do 5 squares a month....this pattern is so fun and fast that I am hooked.....yes...I do have excessive behavior.....yes....I could not put it down until I have it all finished..... If you are interested in what others are doing go to Bit N by a quilting bug, there is some awesome snow fights out there!!! You are saying what is she doing with all that black and white fabric. Well.......it is a secret...because right now, it is trapped in this pea of a brain of mine and so.....within the next few months I am going to try to rid my mind of the black and white impressions I keep getting......and if it turns out...you all will be the first to see it...and if not...you will still be able to see it.....no shame here....as far as I can tell, we are all in this together!!!! And isn't it a fun ride? IS IT POSSIBLE TO HAVE SNOW IN AMERIKA SAMOA? I have a small stash of vintage fabrics, I made this potholder from 70's fabric. I might redo the binding, don't like how it turned out. Then there is snow and more snow at my house.... I just love these blocks and the colors. I would be done but I miscalculated and so I am having to make more snow. So when I found out I had miscalculated, I stopped....just stopped....will pick up again later. Alot of you liked the picture yesterday so I am leaving you with another one. As I was doing this, I was thinking, was this suppose to be scrappy? Am I going to be thrown out of the group? I love how it is turning out, I haven't ironed it yet, alittle bumpy. Pat over at A little of this and a little of Pat, has asked us to go to the 5th folder, 5th picture....mine were just quilts so I decided to fudge a little and give those of you who are freezing an ocean view. If you joined us today, we would love to see what you did. I know over at Granny quilts, she just picked out and cut her material for a tote....how fun is that? I didn't think I was going to have time today but we had a tropical storm and so I was homebound. So here is what I did. It is called Checkerboard Cherries out of the Thimbleberries book that Gene sent me. Yes, I know, that was not what I showed I was going to do...can't a woman change her mind? Hope all of you that joined us will check in and let us see what you have done. Crazy bout Quilts, she did a few things....she really got into the swing of things today!! Hope you can join us next month!! A THING OF BEAUTY IS A JOY FOREVER!! I have quoted that before. I just wanted to show all of you what I did with Betsy's wall hanging she sent me. There is it for me to admire in my kitchen. Those hooks are for pots and pans but unfortunately my pots and pans are not prestine enough to go on hooks for all to see....see where I put the pot holders (I just can't bare to use them)....and the towel...it was on the oven door but we have a guest and so I put it away so it would not be used........I just love these...and I am going to check for mold every so often and well...guecko products can be washed. Yes, we all know that I can get pretty hung up on one thing...so here is another heart. The winner is Colletta's kitchen Sink, she has a wonderful blog. Her blog has been kinda new to me and I have really enjoyed it. Today was a very productive day.....I can only show you one of what I got completed....and that is this pretty pink pillow for a friend of mine....her birthday is tomorrow. Don't you just love the fabrics on this island? Notice how happy Mr. Pfaff is? He can now see.....and yes, it is for Mr. Pfaff....(it is not because I am aging), it is not because I can't see good enough....really....what did you think? Is it always about me (smiling....because we all know it is).....in my universe, it is all about me.....so welcome to my universe!! I have to tell you about my new best friend forever, Kelly over at I have a notion, she sent me a light a few weeks ago, several of you asked me how I liked it. I wasn't able to respond because it was an internation plug so I had to send it back. She felt horrible, she immediately sent me another one, even sent me five dollars for the cost of my shipping the old one back (I told her not tooo). So you all know that she stands by her word and she wants everyone to be happy. I am very happy, I will enjoy this light. It has little clips to clip the cord around the back of the machine and out of the way. Go to Kelly, tell her you want one and check out her other items too. She is also raising money for the Haiti victims....what a big heart. Next you see that I was goofing with the heart that is shown over on the side bar, just click on that if you want the tutorial. Well...these are done without the lace and the decrative stitches and......I sewed all around the heart and cut an opening in the back to pull the right sides through. I will just glue the lace that loops for hanging it over the hole. I am going to make some more and will show those later. Don't know if I want to cut into my good fabric again, maybe I will use my not so good...save the good for something awesome. I LOVE THIMBLEBERRIES..... I have said that...you are right!! 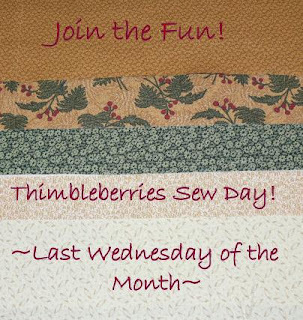 Well Sandi over at Crazy bout Quilts and I were emailing back and forth about our love of Thimbleberries..... She said let's make a sew day once a month. I wrote back and asked her if she was funning me....not to toy with my emotions. She wrote back and said she was serious. So we decided on the last Wednesday of each month...Starting the 27th. You can do what ever, work with their fabrics, pattern, finish a project, and then post what you are working on on your blog for all to see or what you want to work on. Or this pattern I picked up at a quilt store in Texas???????? Maybe my day will be spent deciding on which one and what fabrics??? To be honest, I am having bad sew days lately, I just ruined a quilt just this week, I started it on Monday and by Tuesday I was a wreck...needless to say, I am giving the sqares away to a young girl to practice her blanket stitching on......Sheesh!!! Since those sewing buttons went over really well, I have decided to add a few more but these are going at 75 cents a card. The sewing buttons are still at 90 cents for my viewers. I do not have these added to my site yet. I am going to add some for cheaper than 75 cents but for now...the buttons you see below, that is the price. Am I shamless or what...but if I can find a deal and share it with you, why not? I also have 1/4 inch rick rack, white, black, and yellow, only the black and white are in the store but it is going for 50 cents a yard or 40 cents to my blogger friends. I have ten yard each. I will try to make this the last business post for a while. Thanks for your patience in my indulgence of buttons. Just look what came to me from my niece's store, Inch Worm Fabrics,, ohhhh my goodness....look at all the eye candy and the tummy candy... My niece, Jennifer, takes such good care of me. Two patterns....one is a bag pattern....can't wait to get my hands on that one. I don't think this is in her store yet...so you heard it first here!!! I am loving those bright flowers....ummmm ummmmmm good!!! The L'Mour line....oh my........need I say more? More fabric.....be still my heart!!!! I think some of these are not in her store yet either...so be looking out for them. Eye....yi....yi......me thinks I am in LOVE!!!! I just can't take it...can you? Go on over to her store and give her some blogging love!!! Thanks Jennifer!!! I got the sweetest email from Diane,....she told me she found a book that she wanted to send to me, she was at the store and thought of me. WOW.....WOW.... that is all I can say...is WOW. She sent this wonderful Book of Hawaiian quilts, the history and what the inspiration was behind them. The quilts are amazing just as she is for sending this to me. She sent this cutest little Hawaiian shirt, I want to make some Diane....you have a tutorial of it? then some wonderful fat quarters. Thanks soooooooooooooooooooooooooooooooooooooooooo much!!! I ONLY HAVE FOUR BIRTHDAYS FOR FEBRUARY....PLEASE SIGN UP FOR YOUR BIRTHDAY.....WILL HAVE A BIRTHDAY GIVEAWAY FOR EACH MONTH. OH MY GOODNESS......LOOK WHAT SANTA BETSY SENT ME FOR CHRISTMAS!!!! I just could not believe my eyes when I opened this package.....I am still in shock....I almost cried....If my husband had not been home, I would have. Betsy over at Quilting Fiesta sent these to me....ohhhhh my...wait till you see what is in the packages!!! She knows my husband loves chickens, so we have chicken coasters, chicken hot pads, chicken trivet and chicken towel.....can you believe it? I dont want to use them...I won't use them....I will just sit and look at them.....although, I am letting my husband take the coasters to work with him. Thank you so much Betsy.....I feel so undeserving but very blest to have such a wondeful friend as you. Yep, that is right...that is me....but I have gray hair...HA!!! me again....STILL determined...so I finished it, bound it and it looks like a first grader did the border and binding, I dont' even know how to fix it...maybe it will be a tote and some cosmetic bags...maybe....I don't even want to look at it.....I want to rip it to pieces....I know all of you are wonderful quilters and can't seem to understand my frustration...sorry....(that is my way of saying, please tell me you have bad days and bad projects)....but things in my world don't go as planned sometimes and this is one of those times....so I am going to make muffins and granola bars today...maybe do the gazzell (work off excess frustrations). Glad hubby is at work. Oh...he informed me that he needs clothes (what is up with that)...I just did laundry Monday...he needs clean clothes?...go figure??? Every once in a while we have the chance to make a difference in someone elses life. Every once in a while we have the chance to make a difference in many lives. Blog that want to help the people in Haiti!! 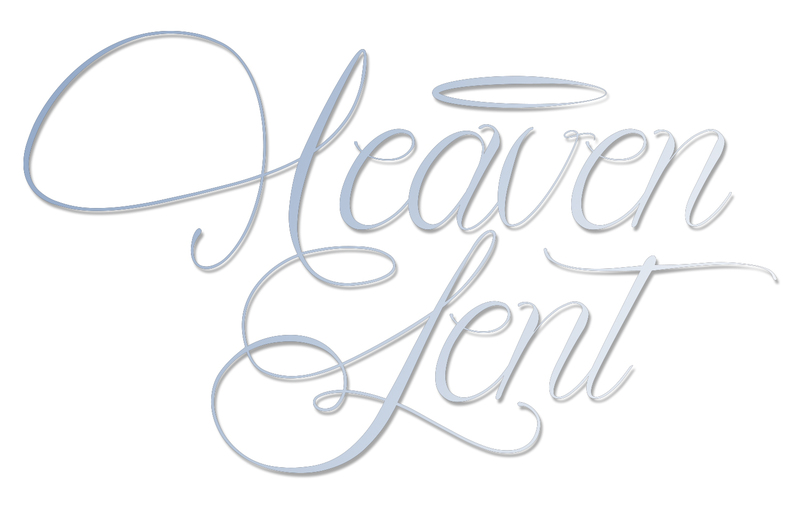 I have a notion has a new blog up just for that purpose. Kelly is one awesome lady with a huge heart, go on over and take a look at what she is doing and see if you are interested. Then there is CraftHope, they are putting together a Etsy store for the survivors of Haiti. MY LITTLE BIT OF ADVICE FOR TODAY! TO JUST LEAVE WELL ENOUGH ALONE!!!! GET IT!!!! REPEAT AFTER ME!!! So you say, what on earth is she talking about..... Okay...so I am sewing on the below quilt....everything is going along sooo good....I am even singing as I go along. Happy that life is being so good to me and Mr. Pfaff has no complaints of the day. yes....can't just be happy.....the dial....it is screaming to me. Yes...I was hopping and skipping along, turned the dial....kept sewing...finished what I was doing....and...you guessed it.... I totally messed up the tension. So repeat after me...."LEAVE WELL ENOUGH ALONE"! My niece at Inch worm Fabrics says that you can get any fat quarter from any fabric in her store for $1.25...that is a good deal, you just have to let her know what you want. Looks like he has been in some kind of accident!!!! No worries momma will fix it!! We have alot of kids on the island that are afraid to go to school after the tsunami....so this will teach them that it is okay to be afraid but that there are some things you can do and what to do incase of another tsunami. The turtle is the star. GO PUT SOME CLOTHES ON....NO ONE WANTS TO SEE THAT!!! OH THE MENTAL PICTURE WILL NOT GO AWAY....MAY HAVE TO GOUGE MY EYES OUT!! Oh....I know you are out there....no need hiding either!!! Well...been a fast few days. Aunt Pitty Pat was asking if someone would take the place of someone in their Christmas Swap.....I had wanted to do this in the beginning but didn't know what life would be like when I came off vacation....sooooooooooooooooooo I jumped at the chance. The above square is my one square....all I have left are the window panes...and then the 9 patch....want to have them out in the mail on Thursday's run. Got involved for 2 days with W-CAP (the woman's non-profit organization) making puppets....so haven't been doing any personal sewing. If you are passing through or think I don't have your birthday...please leave that as well. oh....got the pattern at fat cat patterns, I downsized it to fit a 12 1/2 inch square. You might think these were moonshine bottles but NOPE!!! They are the old Clorex and Purex bottles..... Now....if it was me and I had these bottles and knowing what clorex does to your clothes.....well.....I would be afearing......afearing that the bottle would break and ruin whatever was in it's path!!!! These were not suppose to come here but were suppose to be in storage...oh well.. I won this wall hanging a while back from Diva Quilts. This photo does not do it justice....absolutely amazing.... Thanks so much Kit, it truly is lovely. She truly is an artist that thinks outside of the box. Then this next package was a total surprise. 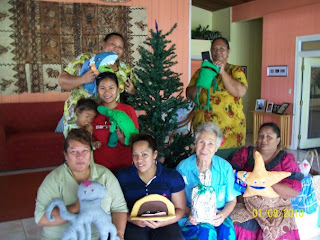 Regina sent this to me, she is the one that won the Ginger Jar quilt. Look at the little bag.....look what is inside...ummmmm but that little bag is the cutest. If my memory serves me right (could be wrong) but she sent me the pattern for this but I couldn't figure it out but now thatI see it.....easy and soooooooooooooooooooooooooo cute. Love the pin cushion....What a fun surprise. I also got some wonderful Christmas cards, thanks soooo much!! LOOK WHAT IS JUST A MOUSE CLICK AWAY!!! DO I REALLY HAVE TOO??? I tried every way in the world for it to fit in my luggage....but then the fear of it getting broken came to play. But here it is in the Dallas airport eating with us at Champs. Got some really good questioning looks....the security at the Dallas airport was really rude about it...she said she guess I could take it with me. WHAT!!!!! She guessed....who was she anyways?????? I didn't have any carry on luggage....some people and authority!! Okay, we won't open that can of worms or get on that soap box today.. So you ask, along with everyone that was eyeing me..... WHAT IS IT??? Is it a thin skate board with no wheels? The blueprint for my new sewing room (oh...baby yesss.....come to momma............but nooooo). oh...why is she my new best friend? Why else.....she has all these wonderful play pretties and if I am good, maybe I can come and play at her house!!!! Oh...I have a really really adorable (mother of 3 sons) friend that has started a blog, if by chance you have a few mintues, go check out her blog. Yes, she lives in Texas. 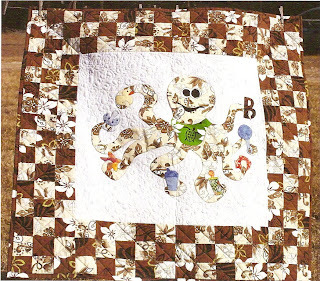 Her name is Jennifer and her blog is Patchwork Possibilities. She is truly awesome and has been quilting for years (for her years that is, she is still a young chickie). Next to last day for my giveaway!!!!! !